The 6% ABV off-dry thirst-quencher is named after William Tell, the expert marksman of Swiss legend who shot an apple off his son’s head with a crossbow, to save them both from execution at the hands of an Austrian tyrant whose hat they had refused to bow to. “We admire the brave, stick-it-to-the-man spirit of William Tell, and like him, we’re standing up for what we believe,” says Rudolph du Toit, national marketing manager for the company. As far as is known, Tell’s is the first and only cider in South Africa to be marketed in a PET bottle, an “eco-friendly, recyclable alternative to glass with a significantly lower carbon footprint”, says the company press release. The global wine, beer and cider markets have seen a marked increase in the use of PET bottles in the last few years, with growing numbers of consumers choosing the greener, more affordable, sustainable option, says Du Toit, adding that both Magners and Strongbow, two highly prolific international cider brands have introduced PET packaging alternatives to meet consumer demand. 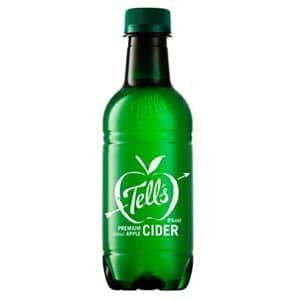 With 10ml more cider than regular South African cider bottles, the Tell’s 340ml pack is still 34% lighter than those of its competitors. The PET bottle, which has a six-month shelf life, is also shatter-proof, making it ideal for occasions where glass restrictions apply, such as concerts, festivals and live events. The 340 ml bottle with a twist-off cap will likely retail for between R163 and R173 a case of 24 bottles, working out at between R6.80 and R7.20 a single unit. A genuine cider is derived from the fermentation of real apple juice, not by flavouring other malt-based alcoholic drinks with apple flavours. To qualify as a cider, in accordance with South Africa’s Liquor Products Act, Act 60 of 1989, products must be made from the juice of apples or pears. While it is permissible to replace up to 25% of the apple juice with pear juice and still market the beverage as a cider. If the word “cider” is not on the label, it isn’t a cider.